The definition of aesthetics has always been difficult to grasp and perhaps what is more interesting in attempts to define aesthetics is the fact that in the middle of the eighteenth century, philosophers deemed it necessary to return to ideas that had been languishing since antiquity. The eighteenth century is the century of reason and rationalism par excellence, but there was a category of thinking and feeling and reacting that fell between the rational and the irrational and the rest of the century would be spent in trying to bring “feelings” into the realm of reason. At first, these studies of what would later be termed “aesthetics” were extensions of pre-existing philosophical systems. On the whole, the qualities of beauty, as they are merely sensible qualities, are the following: First, to be comparatively small. Secondly, to be smooth. Thirdly, to have a variety in the direction of the parts; but, fourthly, to have those parts not angular, but melted as it were into each other. Fifthly, to be of a delicate frame, without any remarkable appearance of strength. Sixthly, to have its colours clear and bright, but not very strong and glaring. Seventhly, or if it should have any glaring colour, to have it diversified with others. These are, I believe, the properties on which beauty depends; properties that operate by nature, and are less liable to be altered by caprice, or confounded by a diversity of tastes, than any other. ..the sublime is an idea belonging to self-preservation; that it is therefore one of the most affecting we have; that its strongest emotion is an emotion distress; and that no pleasure from a positive cause belongs to it. Sublimity, therefore, does not reside in any of the things of nature, but only in our own mind, in so far as we may become conscious of our superiority over nature within, and thus also over nature without us (as exerting influence upon us). Everything that provokes this feeling in us, including the might of nature which challenges our strength, is then, though improperly, called sublime, and it is only under presupposition of this idea wihin us, and in relation to it, that we are capable of attaining to the idea of the sublimity of that Being which inspires deep respect in us, not by the mere display of its might in nature, but more by the faculty which is planed in us of estimating that might without fear, and of regarding our estate as exalted above it. The importance of Kant’s concept of the Sublime is that, unlike Beauty, which resided in object, whether natural or human made, is that the Sublime is a reaction within the mind. But in order to deal with the Sublime in a universal fashion, Kant needed an example of an Event that induced or caused a Sublime reaction. That Event had to have a universal basis (or as universal as a European philosopher in his era could conceive) and Kant’s choice example of an Event in the Critique of Judgment (1790) was the French Revolution. Even today it is possible to understand the feelings of joy, relief and hope for the citizens of Europe, from the peasants to the bourgeoisie, and the feelings of fear and terror on the part of the ruling classes that would have been collectively aroused by the overthrowing of a class that had ruled France for centuries. These feelings, at least in France, would have been fueled by the spectacle of a huge and overwhelming public uprising that swept the spectators up into what Kant termed “enthusiasm,” an intense and shared reaction experienced by the witnesses. Dialectics serves the end of reconcilement. It dismantles the coercive logical character of its own course; that is why it is denounced as “panlogism.” As idealistic dialectics, it was bracketed with the absolute subject’s predominance as the negative impulse of each single move of the concept and of its course as a whole. Negation is of paramount importance for the Sublime which is an odd combination of “Thou Shalt Not” and “Thou Can Not.” It is the issue of “presentability” or “representation” or the conditions of or the possibility of representability that became the mode of entry for Lyotard into the question of the Sublime and the Holocaust. The Sublime is a question of ability and inability. If “taste,” in the Kantian sense, is accord with the capacity or ability to present or to represent an object which can (has the ability to) correspond to a given concept, then the sublime is formlessness or absence of form–inability to conceive and to reason and to utter or to represent. Paradoxically and ironically the Sublime, described by Kant as mathematically infinite, is also about limits. The imagination, limited by the Event, fails to present any object that could possibly conform to the concept, which is, in itself, is incomprehensible. In its own way, the Sublime is iconoclastic and opposes graven images. Because the sublime is unpresentable, the figuration or representation must be avoided and what is (not)presented must be blank or blanche, not empty or wiped out but simply absent, to convey the limits of an imagination brought up short by the Event. The Sublime makes us see, shows us only through taboos and by prohibition, meaning that for the artist, the issue becomes how to present the unpresentable without presenting it. Thus the power of the poetry comes from not saying and the pleasure of not seeing comes from the pain of being deprived of the privilege of the direct gaze. That said, in the nineteenth century, many works of art were considered “sublime” in the general parlance of the time. 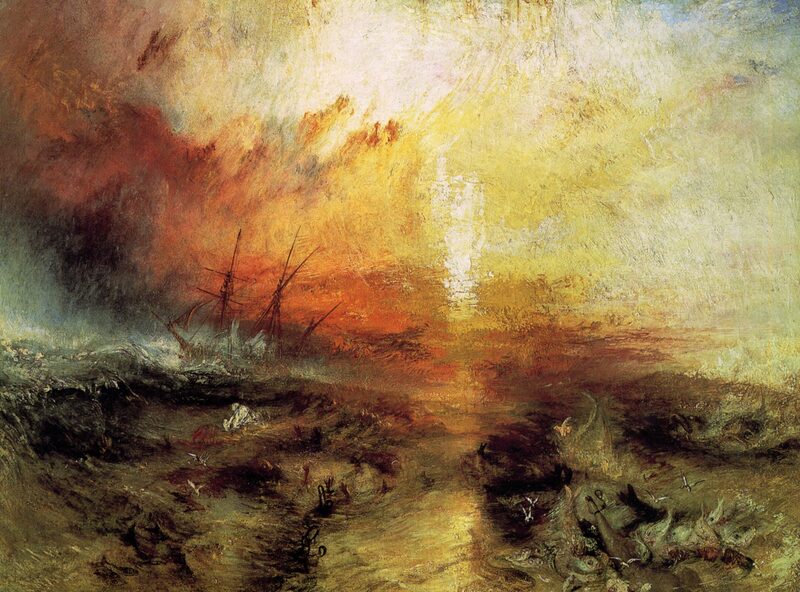 For example, J. M. W. Turner’s painting Slavers Throwing overboard the Dead and Dying—Typhoon coming On (1840) was described in 1843 by John Ruskin in the following terms, ..the whole picture dedicated to the most sublime of subjects and impressions—(completing thus the perfect system of all truth, which we have shown to be formed by Turner’s works)—the power, majesty, and deathfulness of the open, deep, illimitable Sea. One of the cornerstones of the nineteenth century mind was its supreme confidence in its ability to conquer, even the unconquerable notion of the Sublime. Turner’s The Slave Ship is surely an example of the concept of the Sublime of his century but it violated the “rules” of the Sublime, which are that the Sublime is an Event and that this Event cannot be depicted. But, in its assumption–manifested in Turner’s painting–that the Sublime can be viewed/seen–the reading of the Sublime has weakened and had been watered down over time. The vernacular interpretation of the Sublime as had been inherited by the twentieth century had to be contested and the meaning to of the Sublime needed to be brought back to its original sense–the Sublime cannot be thought much less presented. In 1991 Jean-François Lyotard set out to deal with that which is unpresentable, which will be discussed in the next post.